The balance of the yard was rototilled about a foot deep to dig up the remaining roots. I worked the rototiller so hard that I eventually broke it too. Fortunately, I was 99% done when it died. Next time, I'll pay somebody to operate that infernal machine. 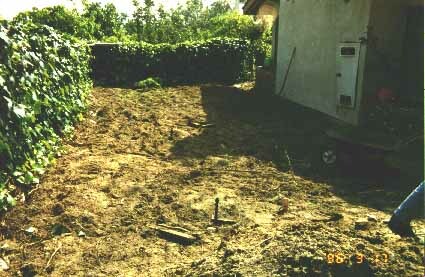 During construction, I literally wore out the garden wheelbarrow barely visibly in the shadows. After one too many loads of rock, block, and brick, it just fell apart.